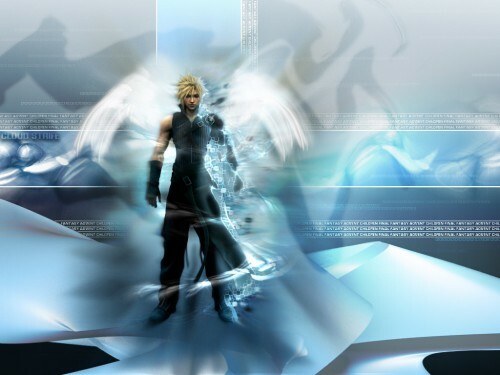 Actually FF7:Advent Children Cloud. Made this one a while ago too. I created his angel wing on accident while trying to do something else, and just went from there. I really like this one too. Pretty fortunate accident, I'd say! The wings look cool. I'm not so sure about the repeated text, but the rest of it is pretty nice. Good work! yo nice picture its something that that i would learn how to do. ill make it my favorite i would like to see more of ur great art. good and the wings are a nice touch too... i'm keepin this.. hehe bye. Quote by TikaKinoPretty fortunate accident, I'd say! Anyways, I actually did enjoy looking over it the first time around. I'm not sure if blending the objects on top of one another and shading the layers was a neat idea, but it does actually seem to fit in with the background quite well, and I pretty much enjoyed the visual content being displayed over the entire wallpaper itself. The way you also made that wavy effect along the background, and boxes to soak in more color within the background itself - it's a nice concept. The remaking of the wing was also a nice touch, but yes, it does seem to be a but detached from the main character itself. I was hoping that the background would have been more flare added onto it, detail-wise, but its still a good wallpaper designed overall, nonetheless. Could have been better, but its still a nice piece to look over. Good job, and keep up the nice work. yeah I am just keeping it with me...nice idea with the wings but would be better looking on sephiroth altough a really awesome work! Great stuff man. I wish I could get that effect. With what software did you do it? It could not be Photoshop. extreamly nice. Got to Got to be a Fav. It really does true justice, and almost seems as tho the wings stem not from cloud but from someone behind him, almost looks female. But I digress, this is truly beautiful, and is going to the favorites.